A mother walks into our pantry with her young daughter and son the other day. They’re tired and haven’t had a decent meal in days. After hours of searching for help, the family found their way to CUMAC. We quickly learn that mom lost her job a few months back, and eventually the family had to give up their home. Forced to move from shelter to shelter, they’ve faced weeks of stress and uncertainty. They need support like never before and fortunately our team is ready to help, and not just with food, but with kindness and love. As their grocery bags are prepared, Jeni, one our team members, gives the children a package of apple slices to snack on. The young boy smiles, his face lighting up in joy with each bite. Our team then brings out food, hygiene products and other essentials for the family. Halloween was just a few days away, so our staff even brought out two costumes for the kids to brighten up their day. The boy wastes no time and immediately puts his costume on, right there in the pantry. Want to help us feed people & change lives? Sign up to volunteer, hold a collection or make a donation. Together, we can build a stronger, healthier community! After several months of hard work and planning, we’re excited to announce that Place of Promise, CUMAC’s supportive housing program, officially has a new home! As many of you already know, we decided to move the program to a new location in an effort to give our residents more space and better amenities. We first mentioned our plans to move in our newsletter and we were blown away by the outpouring of support in response to the article. Many of you answered our call by donating household items, furniture, glassware and so much more. For more on Place of Promise visit our programs page. Do you have new or gently used items you're hoping to donate? Learn more about donating to CUMAC by visiting our Community Closet page. Brett and Esther Zuckerman live in Ridgewood, NJ with their two children, Ellie and David. The Zuckermans are an active family and are always looking for ways to give back. They’ve held coat drives, volunteered at local agencies and assisted with special events around our area. Recently they discovered CUMAC and decided to support our work in a unique way. Brett’s father worked for a fine glassware company and over the years he developed a huge collection that was stored in his basement. The glassware wasn’t being used, and so the family decided to have a special sale and donate the proceeds to CUMAC. The Zuckerman family made signs, set up tables full of items, and even put up a huge Tiki man in front of their house to draw attention to the sale. They also set up a stand where the kids sold lemonade and homemade brownies throughout the event from their driveway. It was a long day for the Zuckermans, but they told us that it was completely worth it. The event had a great turnout and the family was amazed by the generosity of their customers. Many people paid extra for the glassware after learning it was for CUMAC, some stopped by just to make a donation. “I kept telling my kids that you feed a person a meal, it's just a one-time event” says Brett. “But if you give a family a bag or two or three of groceries, you can feed them for a week and give them some control of their lives.” That sentiment kept their family motivated all day long. When the event was finally over, the Zuckerman family raised over $1,100 to feed people & change lives. We were blown away. Thanks to this amazing family for their incredible generosity and for reminding us that we all have the power to make a difference! Many of us struggle to find the balance between our professional life, our social life and our philanthropic life. We want to give back to our community somehow, but don’t necessarily have the time. Fortunately, with the help of corporate volunteer programs, getting involved is now becoming simpler than ever for many. At companies across the country individuals are being given the opportunity to take time from their regular work day to provide hands on service throughout their communities. The benefits have been enormous. Through corporate volunteering, individuals have the chance to not only help organizations improve, but they also help themselves and their company improve. Here are some key reasons why you should get your workplace to volunteer: it grows your company’s visibility and it encourages professional development, leadership and team building. For corporations like Columbia Bank and NEC Financial Services, free time is not something they necessarily have; it’s what they do with it. In recent months, both companies have been putting their best foot forward to make time to give back to their community. NEC Financial Services has been an asset through different areas at CUMAC. 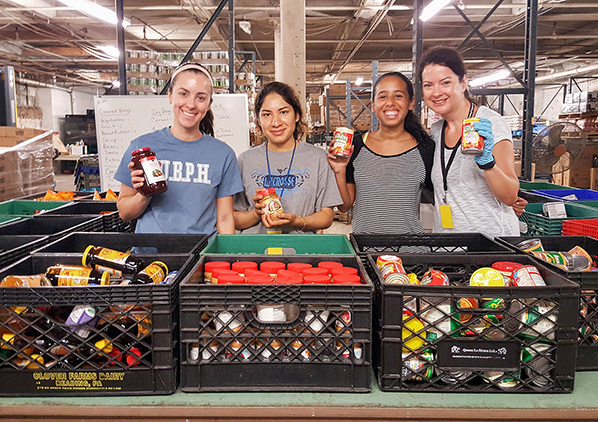 Along with volunteering, the company has regularly held food drives and collections. On various occasions, NEC has consulted with CUMAC regarding building projects that would be beneficial to our daily operations, along with providing further assistance through grant funding from its affiliate, NEC Foundation of America. Just minutes away from the NEC office, CUMAC has become sort of a home away from home for their team, giving staff an opportunity to provide volunteer support directly to their community on a regular basis. Many people struggle to balance their work life and social life which leaves little room for philanthropy. They often state, “If I had more time in a day or days in a week I could get more done”. What if I told you there was a way to include philanthropy in your schedule without much interruption. If you’re looking for a way to celebrate National Give Something Away Day, this is your perfect opportunity. Share this day with family and friends via social media to encourage them to join in on the celebration by using #cumacfeeds #givesomethingawayday or #hungerhelpers. For more information about CUMAC operating hours or other ways of giving, please visit our opportunities page or give us a call (973-742-5518). Rev. Pat Bruger began her journey as an advocate and leader for the hungry in 1991, when she became only the second paid Executive Director in CUMAC’s history. This week, after 26 years of feeding people & changing lives, Pat is retiring from that position. While Pat will certainly be missed, she's developed a strong foundation for CUMAC, and our team is prepared to take the organization into the future. To honor Pat and her incredible career, our staff surprised her this week with a special farewell celebration full of pizza, ice cream and lots of love. It was the least we could do for a leader that has done so much for our staff and community. Pat, words can’t express what you mean to CUMAC. Your hard work and dedication have helped provide millions of meals for the hungry and changed countless lives — ours included. Thank you for your leadership and for turning CUMAC into the organization it is today! To read more about Pat and her career, check out this article from the Paterson Press. I can still hear my mom’s voice “Eat your fruits and vegetables, they are good for you!” And as an adult, I echoed those same sentiments to my boys. Lucky for me and my family, fresh fruits and veggies have been part and parcel of daily life. Now, with thanks to the Community Food Bank of New Jersey, healthy and nutritious fruits and vegetables will become a staple among pantry clients in the Passaic County community. Ayla is a student who has a passion for wellness and making her community a happier place for all. Over the last year, she has worked in just about every CUMAC department. Week in and week out you’ll find her somewhere around CUMAC’s building, assisting with everything from packing bags and sorting food to stuffing envelopes and office projects to community outreach and education. What’s really remarkable is that you won’t just see Ayla helping out with a volunteer project; you’ll often find her guiding others, teaching new volunteers or facilitating projects. Over the last year, she has really become a leader around our building, and having her around has provided our team with the flexibility to focus on multiple projects and accomplish more as a staff. Words can’t express how important that is when your programs are serving thousands of people in need every month. As president of Montclair State University’s Dietetics Organization, Ayla has also helped organize several food and clothing collections and has rallied students around campus to get further involved. During times of great need, she’s responded quickly and efficiently to ensure that help is on the way. We are lucky to have such a dedicated volunteer on our team. Thank you Ayla! Your efforts continue to inspire us every day. At times of great need, it’s comforting to know that there’s someone you can count on. For CUMAC, that someone is a volunteer by the name of Stu. Over the last year, Stu has gone above and beyond his volunteer duties to help CUMAC feed people & change lives. What’s truly special about Stu is his readiness to tackle any situation. He’s always game to help where the need is greatest — some days that means hitting the road with our driver picking up thousands of pounds of food, and other days that means hours of working in our pantry or packing bags in our basement. For Stu, no task is too challenging, and he’ll often come in early or stay late to ensure that CUMAC is able to serve all who come our way. At the core of Stu’s dedication is a strong belief none among us should go hungry. He’s passionate about helping those around him and that can be seen every time he comes to CUMAC. Knowing how large of problem hunger has become in our community, Stu is intent on doing everything he can to make a difference. His willingness to jump in wherever needed has made him an invaluable part of our team, and has allowed our team to reach even more of our neighbors in need. Not to mention his sense of humor and fun conversations always keep the mood light, even on the most hectic of days. Thank you Stu for all that you do! Some of you may be asking yourself, “why does she care”, while others of you may have made the connection that I am a millennial. As someone with over four years of non-profit experience I can contest to the stereotype which previous generations have labeled us. I’ve always considered my peers the ‘generation of change’. We are likely to be the group to roll up our sleeves and get our hands dirty to be the change we would like to see in our communities. Over the years, volunteerism has become one of my greatest joys. Oppose to what generations before me may think, my interest in volunteering was not motivated to make myself look good on college applications. I didn’t want to brag about my “good deeds” during job interviews, I genuinely wanted to make a difference. Through these experiences I’ve learned four key factors that I believe everyone should consider about volunteering. 1. Learning Experience: At times we become so consumed with our reality that we ignore things going on around us. Volunteering allows you to step outside of your comfort zone and forces you to put yourself into the reality of others. While gaining new insight about surrounding communities and other issues, you also gain new insight about yourself. This could come in the form of learning a new skill that you did not know you possessed or encouraging an interest in a hobby or topic that you may have not considered before. If an experience or situation encourages you to ask further questions or influences you to become part of the solution then you have learned the importance of volunteering. 2. Build new relationships: It does not matter if you are young or old, building relationships are vital. During your volunteer time you will come across people who may share your core values, your interest in hobbies or in most cases your reasoning for volunteering. A small conversation could lead to lifelong friendships or professional relationships. Just as volunteering, building new relationships is all about taking something small and manifesting it into something bigger. 3. Feeling of accomplishment: Volunteering isn’t always easy. Some days are more strenuous than others, but once all is completed and you take a look at all you’ve done you begin to feel a sense of accomplishment. For many people, me included, no amount of money could compare to the joy gained from volunteering. 4. You make a difference: Ancient Greek author, Aesop, once said, “No act of kindness, no matter how small, is ever wasted.” It doesn’t matter if you put in minimal hours of volunteering or maximum hours; the only thing that matters is you gave! When volunteering your age does not matter, your heart does. I challenge every person who is reading this to find an organization that you connect with and answer their call to action. 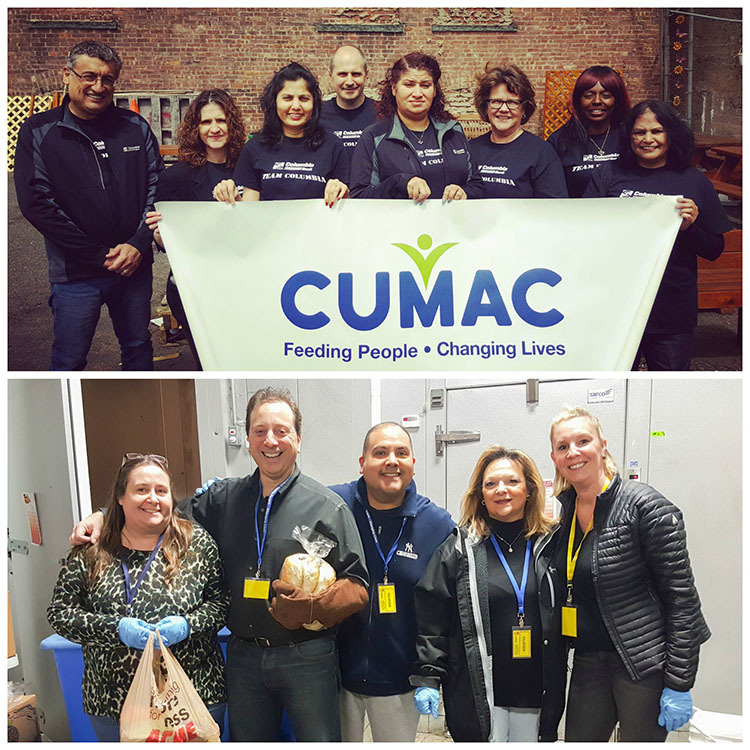 For anyone interested in alleviating hunger within the Paterson area, visit CUMAC’s website for various volunteer opportunities. Can't make it to CUMAC? Consider holding a collection or food drive. For all other interest please visit Volunteer Match. Do you love volunteering? Share your thoughts with us below! Happy National Volunteer Week! We'd like to take a minute to say thank you to all the wonderful people that donate their time to CUMAC and other nonprofit organizations around the world. Because of you, our community is a better place and that's something to celebrate. In honor of this special week, we asked some of our volunteers what they love about volunteering with CUMAC. We hope their words inspire you the way they inspire us! "Volunteering at CUMAC has allowed me to make an invaluable connection with the Paterson community. CUMAC brings different kinds of people together to create something bigger than ourselves"
"Dedication, compassion, can do attitude, mission to serve, no other organization I’d rather volunteer for. These are the words that come to mind when thinking about CUMAC and the work they do. Volunteering for CUMAC has been such a rewarding learning experience for me. The staff, who comes from which all walks of life, always shows a constant positive attitude in helping CUMAC and the citizens they serve. To work in a warm, caring environment where helping citizens is a priority is a real joy and a personal reward for me." "Volunteering at CUMAC has been a blessing to our church. It has allowed our young people to see life outside of our comfortable suburb and to see the needs of our neighbors. CUMAC has offered us opportunities to serve and be productive in a meaningful way. We have been involved with this organization by collecting food and supplies, playing music at fundraising events, serving food at charity functions, and going to the center to sort food. The dedicated staff continues to guide us and provide us with these opportunities. The best part of our involvement with CUMAC is both youth and adults are working together for a common cause on an even playing field, which has drawn us closer as a church and helped our various members get to know each other better, united in a making a difference together." 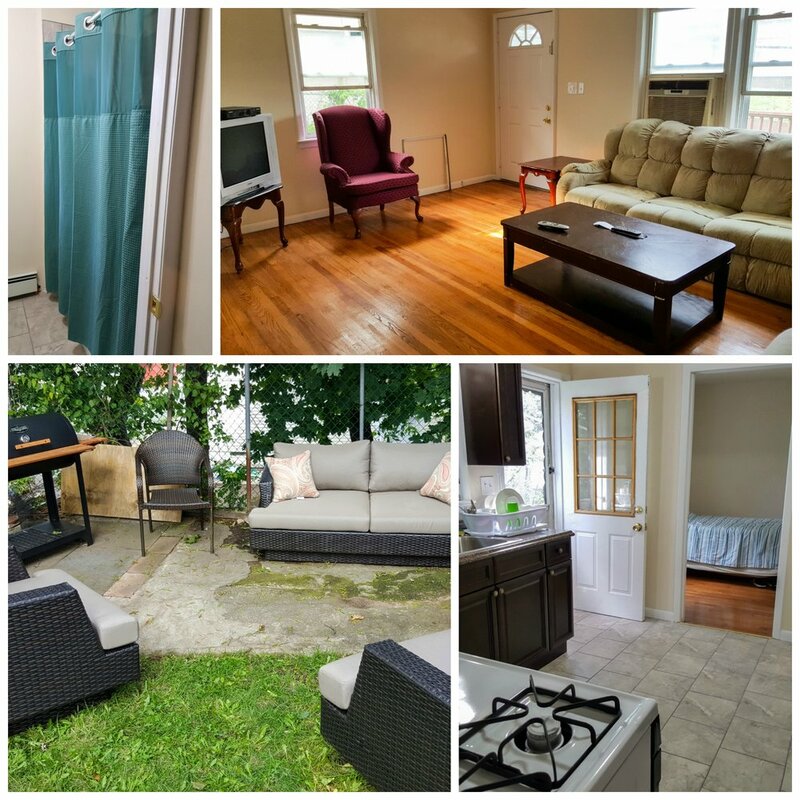 "There is so much that I love about CUMAC. I spent a good portion of my childhood in Paterson, I've seen the decline even from then to now, and I can only imagine what it was years and years ago. But the city of Paterson will always have a special place in my heart. To volunteer at CUMAC, I feel like I'm giving even the littlest bit of myself back to a community I love. It humbles me so much every single time I'm there. I love all of the workers, and I'm so grateful to be even the smallest part of the CUMAC family." "I volunteer because I love helping people. While I was working in NY I was heartbroken at the amount of homelessness that was everywhere I turned. I knew that I had to do something, so I started volunteering. It has been such a rewarding experience. The people I meet at CUMAC are incredible and truly go out of their way to do everything possible to ensure that the community is fed and cared for. It's the caring for that is so important. People need to know that we care it means so much to them. In a society where there is so much abundance there should not be so much need. I will continue to do what I can to end poverty and hunger." "I was introduced to CUMAC, through my mother and the United Methodist Women from Butler. Volunteering at CUMAC and helping to spread its mission over many years has been a blessing of great joy, given and received." "Ten years ago, when I first started attending FLUMC, I had the opportunity to participate in a Saturday work day at CUMAC. This was my first exposure to CUMAC and from that day on, I was hooked. I have since participated in many more CUMAC work days over the years and helped organize various collections for whatever was currently in need (food, coats, hats and gloves, school supplies, baby diapers, hygiene kits, Easter Baskets, Christmas Wish Lists). Seeing all the good that CUMAC does, all the people that are helped every day and the tireless dedication of the CUMAC staff and volunteers are an inspiration. I am so grateful for everything that I have in my life and volunteering at CUMAC is a way to give back, to help others and make a positive difference in somebody else’s life." "I volunteer at CUMAC to continue to do the work my beloved sister Joyce wasn’t able to finish. She was a kind and caring person who was active in community service. She passed away in 2003. I dedicate my work for CUMAC to Joyce, so her love and kindness towards people lives on." To all our volunteers, any reason you donate your time for others is a good one. Thank you for all that you do. Our work wouldn't be possible without you! Interested in volunteering with CUMAC? Contact our volunteer department. Want to tell us about your volunteer experience? Leave us a comment below! Join us in welcoming Akeera Weathers to the CUMAC family! With Stephanie Ames now leading CUMAC’s Development team, Akeera has taken on Stephanie’s former position as Community Engagement Coordinator, Volunteers. Having several years of experience in recruiting, training and supervising volunteers, Akeera is up to the challenge of managing a volunteer department that handles close to 3,000 volunteers every year. In the short time Akeera has been with CUMAC, she has already seen how important volunteers are to CUMAC’s work. “CUMAC would not be where and what it is today if it were not for volunteers who strongly believe in CUMAC’s mission” says Akeera. We couldn’t agree with her more. Every day you’ll find volunteers around our building, giving our programs the support they need most. Last year, volunteers donated tens of thousands of hours of time, allowing CUMAC to serve over 40,000 people in need. Without our volunteers CUMAC’s work simply wouldn’t be possible. As a graduate of William Paterson University, Akeera is especially excited about working in a community that’s so near and dear to her heart. She also looks forward to using her many skills and talents to help an organization that she truly admires. “When people walk through the doors of CUMAC they are welcomed without judgment and eager hearts. CUMAC is a place of hope.” Under Akeera’s direction, we know great things are ahead for CUMAC and our volunteer department. Welcome to the team Akeera! Angela has been coming to CUMAC for a few years now. She is a kind woman, and always lights up the room with her smile and positivity. Despite working full time, Angela often finds herself struggling to make ends meet. CUMAC's pantry has helped Angela keep food on the table for her and her son. Our Community Closet has also allowed Angela to buy clothing or houseware whenever she needs it, even on a tight budget. However, Angela recently received a phone call that turned her whole world upside down. After months of therapy and recovery, Papi finally came home. However, he was still too weak to work and his family started to worry about his extra medical expenses. Thankfully Angela knew exactly where to go for help. Using CUMAC’s disaster relief services, Angela was able to leave CUMAC with a shower chair, a cane, a walker, a special pillow that accommodates new medical needs and many other items to make her father’s recovery as easy as possible. Her family says those items would have been too expensive in stores, much more than they would have ever been able to afford. Papi has a long road ahead, but he continues to be in good spirits. Since coming home he’s needed another surgery, but he’s currently in rehabilitation and Angela and family are thrilled to see him progressing every week. With his new supplies, he has the support he needs to be more independent and they are thankful for that. Through your donations, CUMAC is able to help clients like Angela and her family. It warms our heart to hear stories like this. Thank you for making it possible. It is with great pleasure that we introduce Kayann, CUMAC’s newest team member. Kayann was hired in December through the AmeriCorps program and we are excited about the wonderful talent she brings to our team. If you’ve been around our building recently you’ve most likely seen Kayann giving tours, leading volunteer projects or helping out in the office. Wanting to get to know our new Volunteer Liaison, I sat down with Kayann to learn more about her life and what led her to CUMAC. I walked away amazed by her story. Several years ago, Kayann and her family fell on hard times. After losing her job, Kayann struggled to pay the bills and couldn’t afford to keep their apartment. “We fell into a long cycle of being homeless, on and off, that lasted for a few years” says Kayann. The instability created by not having a place to call home was hard on their family, and Kayann often didn’t know where they would stay or how she would feed her children. Fortunately, Kayann found CUMAC, and the groceries she received allowed her to keep food on the table during times of great need. She remembers how scared and embarrassed she was when visiting CUMAC for the first time. She had never needed help in her life and suddenly she was no longer able to provide for her family. It was terrifying. But Kayann’s concerns disappeared the moment she walked through CUMAC’s doors. She remembers the care and attention of the staff, that immediately made her feel at home. “Not having a home, there were opportunities I had to pass up” says Kayann. “Commuting was a nightmare because I didn’t know where I was going to be from night to night, or how was I going to get to work the next day.” This made finding and keeping a job extremely difficult. At times she worried her family’s situation would never improve, but Kayann remained sanguine. Finally, after years of instability, she and her family found a place to call home. She hoped a job would soon follow. She searched for jobs constantly, but had little luck. Still, she kept applying. Months later, she eventually found herself back at CUMAC — this time for an interview. She’s been helping us fight hunger ever since. Over the last two months we’ve seen Kayann really grow into her position. She says that support from the staff has boosted her confidence to new heights. She’s passionate about her role and excited for what lies ahead. She tells us that she’s interested in pursuing a career in the nonprofit world, and would like to use her new found voice to become an advocate within her community. Kayann, thank you sharing your story and for all that you do to help feed people & change lives. We’re lucky to have you on our team! After more than 14 years at the forefront of CUMAC’s efforts to feed people and change lives, Development Director, Lynne Bruger, has announced that she is stepping down from her position with CUMAC and pursuing exciting new opportunities to serve within the nonprofit community. Lynne originally came on staff in 2002 after many years as a volunteer and has held multiple positions within the agency. During her nine years as development director she has consistently grown fundraising efforts to meet exponential program growth. With enthusiasm, a heart to serve our friends in need, and a can-do spirit, Lynne started out as a one-person Development Department: coordinating events, writing and disseminating communications, managing seasonal collections, writing grants and spearheading all other fundraising efforts in support of CUMAC’s mission. In recent years, she has helped to create and lead a robust development team, which now includes three Community Engagement Coordinators -for events, communications and volunteers- as well as a Major Gifts Officer. CUMAC would like to thank Lynne for her many years of service on behalf of the community it serves. Her talent and ability have helped to foster unprecedented growth in the number and breadth of programs CUMAC offers to the community. Her compassion for CUMAC’s clients has been a guiding force. Lynne’s coworkers and colleagues will miss her leadership and creativity, but look forward to her continued involvement as a volunteer and supporter and wish her luck in her new endeavors. Be sure to keep your eye on CUMAC’s blog as Lynne will be saying goodbye in her own words here shortly. Effective January 30, 2017 CUMAC’s current community engagement coordinator volunteers, Stephanie Ames, will be stepping into the role of development director. Stephanie’s transition comes after 8 years as an active member of the development team and more recent work as a contributor to CUMAC’s four year strategic plan. Compete in the Souper Bowl – CUMAC is holding a special competition this month called the CUMAC Souper Bowl! We will be collecting food and funds every day leading up to the Super Bowl. We will assign individuals and groups to teams, keep track of totals and will announce a winner on Super Bowl weekend! To learn more about the competition or to register your group, visit our official Souper Bowl page. Help us tackle hunger this season and sign up today! Become a Collection Coordinator — CUMAC offers all of the training you'll need to hold a fun and rewarding grocery store food collection. As a collection coordinator you'll act as a critical link getting food to those who need it most. To learn how you can become a collection coordinator contact our volunteer department at 973-742-5518 or volunteer@cumacecho.org. Support a CUMAC Event — CUMAC events are a great way to get connected and help contribute to our mission. To start the new year CUMAC is celebrating the 20th anniversary of the Have-A-Heart Auction on February 25. Some other events to follow will include a youth night, a young professionals networking event, and of course save the date for Rev. Pat Bruger's retirement celebration on Thursday, April 27. Check out our event page for more details! We always need volunteers and donors to help with events and seasonal programs such as Easter Baskets, School Supplies, and Wishlist. Please contact Jennifer at jmiller@cumacecho.org if you are interested in participating. Join Team CUMAC – Turn your miles into meals this year! Whether you are running your first race or a lifetime competitor, all runners (and walkers) are welcome to join CUMAC’s race team. Simply register for your event, contact us about your race, and start spreading the word! Encourage friends, co-workers and family members to contribute on your behalf and watch your impact grow. Sign up today. CUMAC is especially low on coffee cans, egg cartons and diapers (size 3+) right now. Hold a collection this year to ensure that our pantry and programs can serve all who come our way. Become a Virtual Volunteer – If you don’t have chance to volunteer at our facility, why not help CUMAC from home? Did you know that you can earn money for charity by taking a survey with OP4G or shopping online with GoodShop and AmazonSmile? Those are just a few of the fun ways you can help fight hunger as a virtual volunteer. See the full list of opportunities here. Hold an event for CUMAC — Can’t make it to one of our events? Hold one of your own! Every year, individuals around our community are finding fun, new ways to fight hunger — from turning birthday parties into food drives to organizing rock concerts, the possibilities are endless with events. Need some inspiration? We can help! Contact our office to learn more. Spread the Word — Hunger affects over 1 million people in New Jersey. Tell your friends, family and co-workers about this silent crisis and how they can get involved. Your voice matters! Get the latest hunger news by signing up for our mailing list, following us on social media, or visiting the CUMAC blog. We're looking forward to another year of serving our community and hope you are too. Join the fight against hunger and make 2017 a year to remember! 8:00am: Bert arrives at CUMAC. He makes himself a cup of coffee and gets to work. After checking the trucking schedule, he plans out his day and catches up on any unfinished paperwork. 9:00am: After tying up some loose ends, Bert grabs his clipboards and heads for the parking lot. It’s pouring out and the wind is starting to pick up. He hopes the traffic won’t be too bad today. 9:10am: Our day begins. We hop in the truck and buckle up. Bert turns the key, but the engine is slow to start. After a few seconds, it finally gets going. Bert sighs in relief and turns to me. “If you’re going to do the job, you need the right tools. A truck is number one,” he says. “We’re going to need a new truck sooner than later” he tells me. “I’ve been taking good care of this one, but every truck has its lifespan. This truck has been on the road for a long time.” Bert quickly checks the truck’s mileage and we hit the road. 9:30am: Despite the weather, the traffic is surprisingly light and we get to BJ’s just in time to secure the final open spot on their loading dock. Bert tells me that it’s important to get to the store early to avoid any lines. He knows that well because BJ’s is a regular supporter of CUMAC, donating food two to three times per week to our pantry. We enter and Bert is greeted with countless smiles and good mornings. After a quick chat with the staff, we’re shown where our food is located. With the help of their team we’re able pack the truck in just a few minutes. We’re off to a great start! As we walk out, we notice three vehicles waiting in line for our spot. Bert smiles. “Good timing” he says. 10:14am: Our truck heads down the road to Trader Joe’s in Paramus, another partner that has been supporting CUMAC for years. Different store, same staff reaction: Bert is greeted with a rush of hugs and handshakes. Bert explains the pick up process and we get right to work, loading the vehicle in a way that will leave us with enough space for the remaining donations. Bert tells me that taking a couple of extra minutes to pack strategically always saves him time in the long run. So we carefully pack box after box, nearly a thousand pounds of fruits and vegetables included. What a workout! 15 minutes later the truck is fully loaded. We take a quick breather and head out the door. Bert tells me he’s happy for the extra help today. It’s crazy to think that years ago much of this perfectly good food would have been thrown away. Fortunately, nowadays more stores are taking action against hunger (and food waste) by donating their extra items to places like CUMAC. Our team and clients are happy about that! It’s 10:34am, our truck has an abundance of food and the weather is starting to improve. There’s plenty to smile about as we get ready for our next stop. As we hit the road, I joke with Bert that he should run for mayor. Everywhere we go people are thrilled to see him and that’s no surprise. Bert is one of the friendliest people you’ll ever meet. Even on his busiest days, he always has time to ask you about your day or make you laugh. He truly cares about those around him. Picking up donations every day, Bert tells me that many of the staff and donors have become his friends. If Bert takes a day off, he hears about it immediately. “Where were you yesterday?” they’ll ask. “We missed you!” It’s no surprise that he is a favorite for so many. Bert loves coming to work every day and getting the chance to thank and talk to those who make CUMAC’s work possible. As we head to Wyckoff, Bert and I discuss an array of topics – hobbies, food, and philosophy to name a few. He tells me about his previous work as a service manager in the auto industry and the trucking company he once owned. We also talk about Bert’s family and how his dad would always help those in need in their hometown in Brazil. His father’s kindness toward others has always stayed with him he says. Bert is happy to have a job that allows him to help his community in the same vein. With so many of our neighbors struggling to get the resources they need, Bert hates turning down a pick up and he’ll often jump through hoops if it means someone can be helped. He may have to rearrange his schedule, come in early or stay late, but he always finds a way to get the job done, even with CUMAC down a driver and short on help. 10:49am: We arrive at the Grace United Methodist Church in Wyckoff, another incredible partner in our work. A lovely woman named Christine, who is in the middle of packing shoes for needy children in Haiti, takes a break from her project to show us where to go. The church’s shelves are packed with donations. Bert and I take turns running out the items. We load over 40 bags of clothing and hygiene products, as well almost 200 pounds of food! Before we wrap up, we chat with Christine for a couple of minutes and she tells us about the project she’s working on. We wish her luck and say our goodbyes. One more stop to go. 11:14 am: We buckle up and head to Costco. More fun conversation with Bert. He tells me that the next trip is different than the others because we’re not only picking up food for CUMAC, we’re also picking up food for another agency who has trouble getting to Hackensack. Bert makes pick ups like these all the time as part of our depot services. CUMAC’s Depot assists a collection of over 40 agencies in our community by picking up, storing and/or delivering food and other resources for them. With hunger affecting over 1 million NJ residents, our team realized a long time ago that we must work together to help stop food insecurity in our area. The Depot allows us to do that every day. 11:39am: We arrive at Costco in Hackensack, a store that has been regularly supporting CUMAC for several years, and our food is waiting for us. Their staff surprises us by offering a full pallet of milk. Bert is thrilled with the news and gladly accepts. In order to accept the milk we’ll need to make more space in the truck so we start rearranging the donations to squeeze in another pallet. After a few minutes, the space is clear and the extra pallet slides right in. Bert and I thank their team for the donation and head on our way. We’re making great timing! As we head closer to CUMAC, Bert turns to me and smiles. “We’re heavy today, my friend. We had a good day.” It takes a second for that to sink in with me. I stop and pay closer attention. The truck was heavy, and now that he mentioned it I could feel all the weight as we cruised closer to our destination. Bert is all smiles because there will be lots of food to share with our clients this afternoon. Next stop: CUMAC. 12:37pm: We’re finally back at our building. We arrive to the smiling faces of our team. Our parking lot is now full and the warehouse is in full swing. We begin to unload today’s pick up, and with volunteers and staff around to help, the truck is empty in no time. I head back to the office, but Bert’s day on the road is far from over. 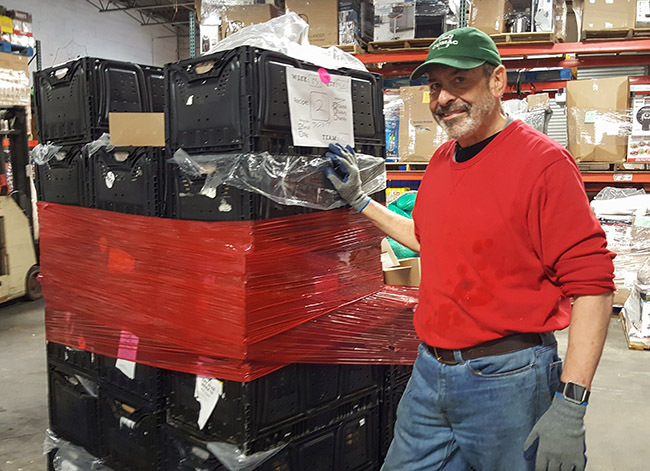 Heyward, our Warehouse Assistant, will join him for the afternoon and good thing — Bert has several more stops to make. This afternoon he’ll be picking up items from a few local food drives, and gifts for our Wish List program. I only spent a few hours on the truck with Bert, but the experience gave me a new found appreciation for what he does every day. It also reminded me of just how much of what CUMAC accomplishes revolves around teamwork. From the groups and businesses donating food to the volunteers unloading our trucks, our community is collaborating in an incredible way. Thank you to BJ’s, Trader Joe’s, Grace UMC, Costco and all our supporters for everything you do to help us keep our community hunger-free. Last but not least, I’d like to say thank you to Bert for all his hard work and dedication. Through his tireless efforts, CUMAC is reaching more people than ever. We’re truly lucky to have someone like him at the wheel! It’s amazing what can be achieved when you’re working together. Want to help CUMAC feed people & change lives? Donate today or join our team. You’re never too young to make a difference. That’s something we learned when we met Maya, a 9-year-old from Glen Rock, NJ, who has a passion for helping others. 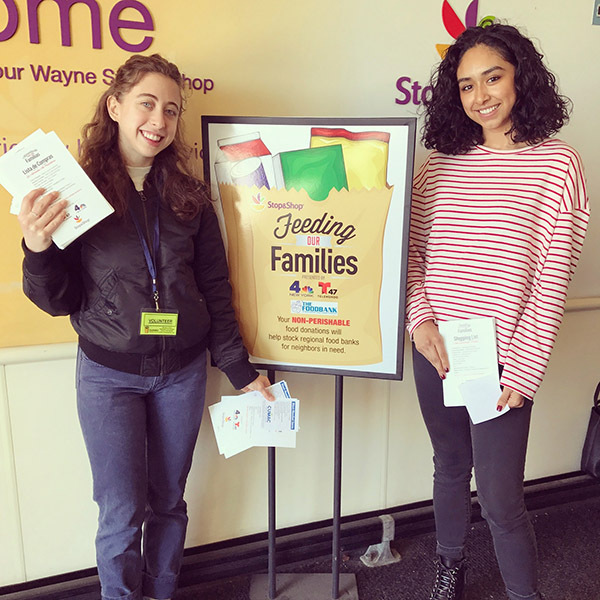 After realizing that she had more than enough "stuff" in her life, Maya has, with the help of her family, turned her birthday into an opportunity to feed the hungry. For her birthday party this year, Maya asked her friends and family to bring nonperishable food items instead of presents. Together, they collected 158 pounds of food to donate to CUMAC’s pantry programs! Maya was thrilled to see so much food come in for her hungry neighbors. This marks the third year in a row that she has celebrated her birthday with a special collection for CUMAC and we couldn't be more grateful. She’s even started encouraging her friends at school to do the same. Stories like this remind us that we all have the power to make a difference. No matter how young (or old) you are. Thank you Maya for feeding people & changing lives with us! Your kindness and generosity continue to blow us away. For over two decades, CUMAC’s Wish List program has helped holiday dreams come true for thousands of kids in our community. Through the program, area youth are matched with donors who want to fulfill their holiday wishes. This year, CUMAC will be giving out gifts to over 1,000 children living in shelters or dealing with illness, poverty or other difficulties and we couldn’t be more excited. It’s a huge undertaking, but with the help of our supporters we will ensure that each one of these kids has a reason to smile this holiday season. With so many donors and kids to worry about it, Wish List takes countless hours of hard work and collaboration. Constant e-mails, phone calls, scheduling and organizing are necessary to make it all come together. Fortunately, Jenn has had some help this year. One of our all-star volunteers, Kathy, has been with her every step of the way, spending several days each week helping her to prepare, check and pack the presents. Several hundred gifts have already been delivered to our partner agencies this month, and we expect hundreds more to go out in the days ahead. Wish List is truly a special program and we’re thrilled for the opportunity to reach so many every holiday season. Thank you to all the donors who are helping bring joy to youth in our community. We couldn’t do it without you! Want to help CUMAC feed people & change lives? Volunteer with us or make a donation this holiday season.